Sometimes when we receive the news that our pet has life threatening abdominal or lung disease, we fear there is no treatment option. However, Drs. Cloutier, Keene and McCaw are experienced in procedures that may enable your pet to live a normal quality of life. Abdominal and soft tissue surgeries are regularly performed at Veazie Veterinary Clinic. 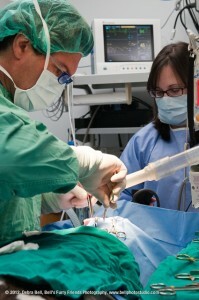 Each veterinarian contributes their own specialized knowledge and training to our various surgical procedures.